Spirits laughing and murmuring to the rain, with tender touches, this romantic jazz fusion Brazilian bossa nova tells of a love, fresh and new. 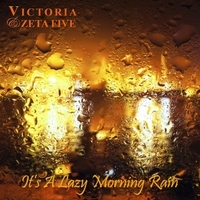 First released as a slow blues / jazz contemporary piece in the 2006 Victoria & Zeta Five "To Be Announced" album, this 2016 romantic Brazilian bossa nova jazz fusion single release of "It's A Lazy Morning Rain" reflects the piece in its original form, when the writers, love fresh and new, spirits laughing and murmuring to the rain, first collaborated. Musicians include Victoria Hammill (Vocals / Electric Violin / Keyboard), Sergio Yazbek (Acoustic and Electric Guitar), Luiz Coutinho (Drums and Percussion), and Kristopher Lee Wade (Bass). Music and lyrics composed and co-written by Victoria and Edward T Hammill.